A non-toxic product, highly water soluble product especially used as a wood preservative to protect against termites, wood moths and fungi. It’s a solid powder of rapid dissolution and high water solubility. 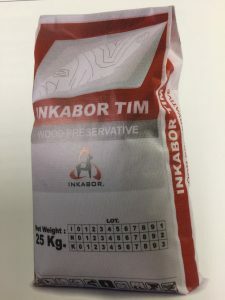 Wood Inkabor TIM has insecticide and fungicide properties suitable as a wood preservative providing protection against wood-eating insects (xylophagous) such as termites, the xylophagous causing wood rot and chromogens causing brown spots on the wood. Conserves the state and natural colour of wood, the applied surface stays clean and odorless. The wood can be sanded, glued and painted with great ease. Paints Inkabor TIM has fire retardant properties used in paint and varnish industires. It acts as a flame retardant; the heat generated by flame forms a solid film like glass considerably decreasing the intensity of the flame. Fire retardant paints and varnishes.